About 200 yards further on in Cliff Tons picture, on the left is Ousebridge Drive. Just spoken to my Mum (who still lives there on Cavendish Road) and she remembers a family of four living in the Cemetry House. Sadly she too doesn't know where Loaches Lane was. OK , in this picture is Tescos as it is now. The purple (ish) line shows where (From memory) The Twitchell ran, the beige line is the old course of Foxhill Road. 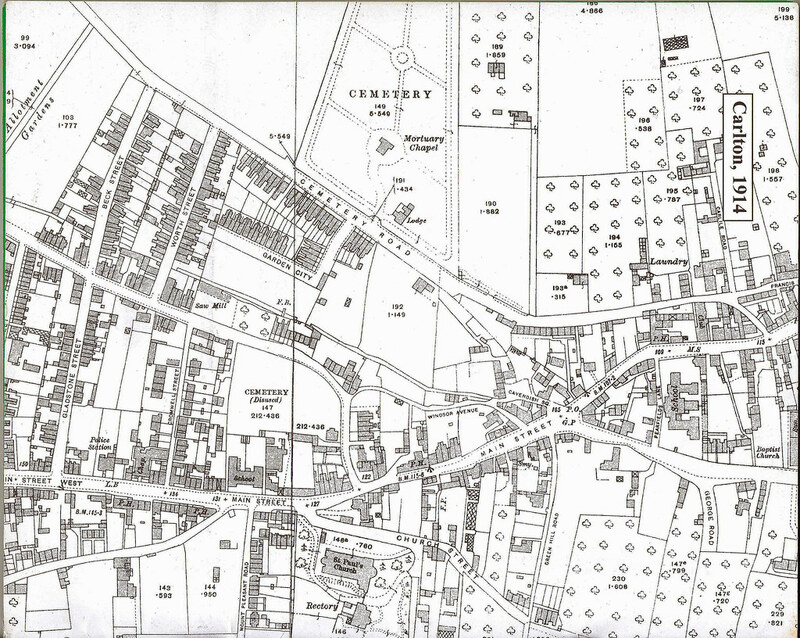 If you look towards the top centre of the map , on Cemetery road (As it was known then) is marked 'Lodge', this is Cemetery House. Perhaps a mod/admin could split this topic. I worked at Brian Pulfrey the printer around that area for six long weeks in the early eighties - comfortably one of the worst six weeks of my life! Used to set the tiny type for garment labels in the composing room there. The place was full of girls though! Situated opposite where it says 'Sawmill' on Foxhill road. After many extensions being added they departed to Bingham Ind Est around 95? A mish-mash of buildings with printing presses in there that looked to me like sewing machines after working at a proper printers before. I had the extreme pleasure of telling the boss there to ram his job one Monday morning, walked out the front door and all the way back to Redhill! I can see my house on that 1914 map, well where the orginal one was. the old st paul school was opposit the church on carlton hill i used to go to guides there and there was a small cottage at the back of the main buildingthe orrigional cemetary was at the back of that on foxhill rd carnt remember there being a houseon there though, i belive the new cemetary on cavendish rd was opened late 1800s i know my grand father clements was buried in there 1920 ish at the bottom end near were the toilets ar now on cavendish and my dad telling methat in them days only that part of the cemetary was ibn use. Re: Loaches Lane ( I am not 100% sure but it could be one of two) I have heard of the lane. At the corner of Cavendish Road and Carlton hill there was a lane there too. It went off at about a 30 degree angle from Carlton Hill More like a bike track that led up to foxhill road, as you walked up it, I remember a big tree on the right. This path went up behind houses and on the right of the lane it was rough grass. It was a tarred surface, but I never saw cars on it. On the google map now it would certainly be under TESCO. This maybe the one. My last post just brought back more memories. I used to deliver newspapers for a newsagent on Foxhill road around 1959 1960 that was where I had heard of Loaches Lane. Although I delivered around that area I did not deliver to that lane. My cousin Brian Shelton used to be the manager of the newsagents. His family, my aunt Mildred Shelton used to live in Marwood Crescent, Just off the top end of Cavendish Road. The first house in on the left. My cousin Ann migrated to Canada around 1964/5. My uncle if I remember correctly was involved in the government in some way before he died. I think he may have been a local member. I remember something about putting up posters in house windows and shops supporting him. I think his name was Arthur Shelton. On the subject of Loach Lane, I haven't found it yet, but I've come across a reference which might give a clue. 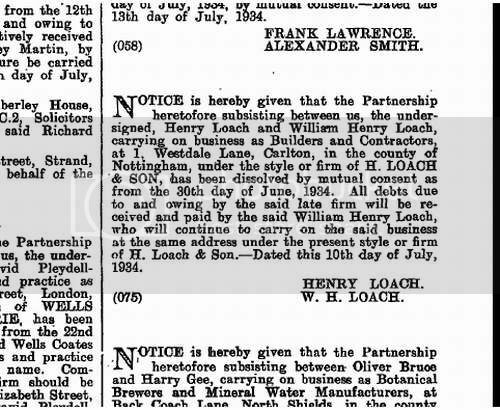 In the London Gazette 1934 is a reference to Loach Builders, who at that time were based on Westdale Lane. It's in the right area, and maybe the Lane was named after some connection with the builders - who still exist but are now in Colwick. I was interested in your Sheltons as my great-grandma was also a Shelton born in Carlton , as was her father . However I haven't gone back far enough yet to establish a link with your lot . Could your cousin have been Brian A. Shelton born in 1934 in Netherfield . 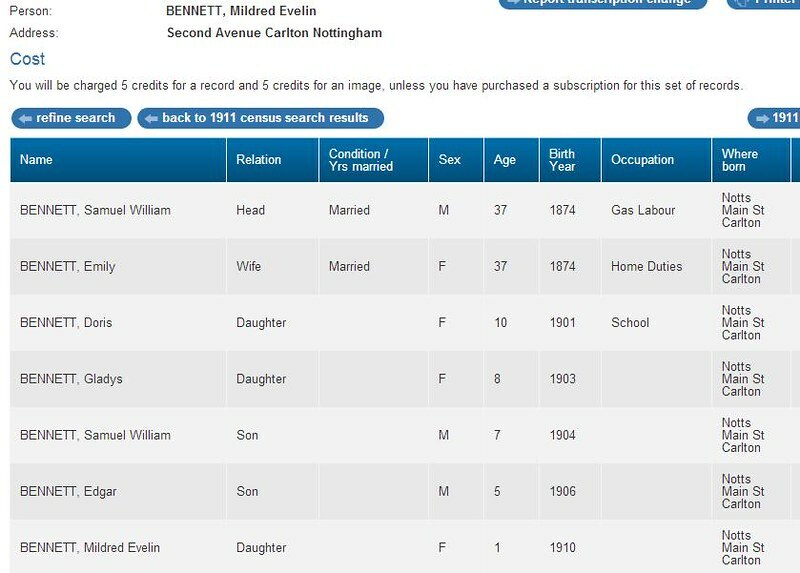 Mum and dad Alfred (not Albert ) and Mildred (nee Bennett) ???? If he is , there is a long line of Alfred Sheltons that go back to at least 1818 starting from Stoke Bardolph . We used to live next door to Loach's workshop opposite the current factory in the 60s. My Dad bought the house of a Harry Shelton (who we called deaf-head) for obvious reasons. Thanks both , will have to look at those Sheltons too . At Gedling School in the 60s , one of my pals was a Mick Shelton , so theres a lot of 'em about ! Just to complicate matters there were also 312 Sheltons born in Nottingham town ! Mildred was my mothers sister. Thank you for reminding me of Alf's name. I should not have forgot it. As I stayed many a night with them in Marwood Crescent when I was little. Also my other Aunt Gladys Newton was also Bennett. Sister of my mother Iris and Mildred. Also related to Billy Bennett the Netherfield window clean. His wife is Grandmother of Jimmy87 notts. Can I PM you with some personal info. Or you can PM me. Sorry I pressed the post button to early. Brian was 13 years older than me ( He would be about 79 now if he is still alive), His sister Ann was about 6 years older than me. She moved to Canada, Got married and had two Children. 1 boy and 1 girl. I cannot remember if Brian was married, I think he was. Was I correct in remembering Alf Shelton being involved in politics? Yes I think he was involved in politics .......feel free to PM me . One more post before bed. DavidW Do you know a Carol Shelton? I think I met her once at Alf and Mildred's house. Carltonlad , despite my great-grandma being a Shelton from Carlton , I don't actually know any Sheltons unfortunately . All the info I have given above is from birth / marriage records online not from any personal knowledge . I can't find a relevant Carole Shelton . (Think your link in #25 is wrong) . There is a Brian A Shelton living not far from Carlton of the right age , I will PM the details . This is possibly your Bennett family in 1911 living at Second Ave , though can't see your Iris . I think Samuel William Bennett married a Emily Phipps .